UPS, like most static converters draw energy from an A.C. mains network through rectifiers. Often, these rectifiers fitted with thyristors are generators of harmonics. 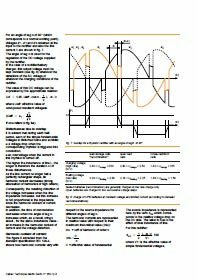 Merlin Gerin, manufacturers of UPS equipment are well acquainted with this problem and consequently have decided to share their knowledge in this «Cahier Technique». In this treatise, the author highlights first the need for a standardized coexistence between polluting and polluted equipments. He then recalls, which harmonic currents and voltages are produced by conventional (classic) rectifiers (thyristor Graetz bridge rectifier) and proceeds to offer various solutions designed to minimize harmonics. Finally, in his conclusion, he alludes to the appearance in the near future of non-polluting UPS equipment and of de-polluting converters. Harmonic currents generated by certain equipment, such as static converters, discharge lamps, arc furnaces etc.. (providing there are many or providing they have of higher power rating compared with the power of the source) can adversely affect the operation of other equipment connected to the same network. they can cause interference with communication and «low current» protection/signalling circuits. A distorted voltage can, in addition, upset the operation of some receivers such as regulators, static converters (when the crossing through zero of the voltage waveform becomes indeterminate). Thus, one of the factors highlighting the quality standard of electricity supply is its voltage distortion rate.